Since 2004, we decided to put aside all the Chardonnay (65%) and the Auxerrois (35%) from the Clos Windsbuhl. These vines were planted in 1988, just after we purchased the vineyard, and we felt that at 16 years old they were able to show the specific character of the old calcareous Windsbuhl soil. In this situation, the grapes grow and mature much slower than in Turckheim, therefore keeping extra acidity/structure but also developing more complex aromatics. Just like the Pinot d’Alsace, the Zind was harvested at a gentle 12.5% potential, allowing us to produce a fully dry wine, extremely pleasant to drink. I must admit that it would also have been a pity to let those grapes through the bad weather that was forecasted for early October 2006, so we took the decision to harvest them before, and eventually were very lucky having done that. 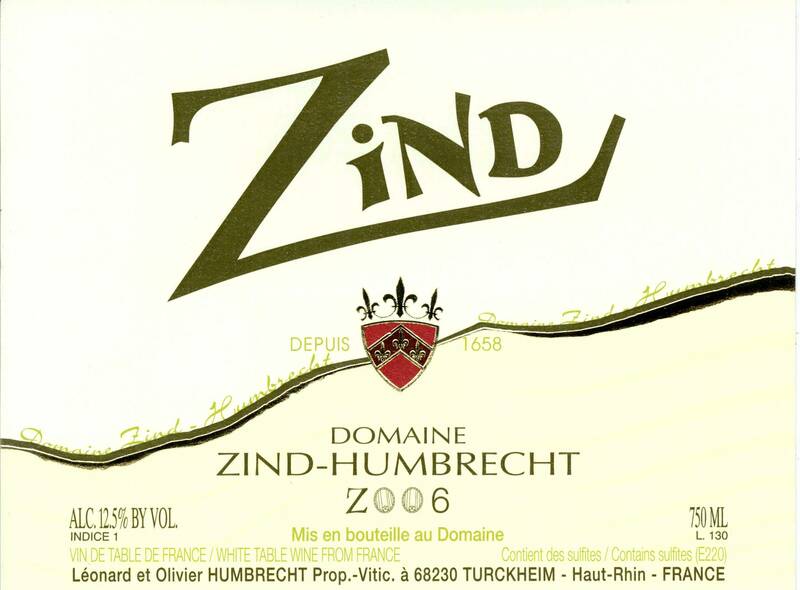 Zind is fermented like any of our other wine in old traditional large oak casks (foudres) and sees no new oak at all. We decided to plant Chardonnay and blend it with the Auxerrois, to be able to produce a wine that has great acidity and structure. The wine fermented quickly to finish dry. 1/2008: The nose really shows the calcareous influence of the Windsbuhl vineyard: there is more minerality, less immediate fruit and more complex lees flavours. The palate is elegant, perhaps lighter than some of our powerful Zind styles (2003/2005), but the result is a well balanced wine, with a slightly lower alcohol than usual (12.5%) which makes it very drinkable.